Submission Tips From Our Junior Editor for Fiction at jaBlog! by Amneet Mann, Junior Editor for Fiction jaBlog! Click to view our submission guidelines and monthly writing prompts. So you like participating in our monthly fiction prompts? That’s fantastic! I love reading all the entries and laughing, crying, being shocked, and sometimes even cringing at the stories and poems I’m bombarded with every month. Don’t worry. I’m just joking! In all honesty, more than anything, I’m always in awe when I read these entries and realize just how much writing talent is out there. It’s humbling for me; I’m truly honoured. It’s wonderful that you all get a chance at get getting published in our e-zine because you deserve it. Your writing deserves to be out there. With all that lovey-dovey stuff out of the way, if you find you haven’t been getting published as often as you’d like, or you have, but like a good writer are always on the lookout for ways to improve, here are some submission tips. Let’s call it a heads-up on things you shouldn’t do when writing a short story or poem for our prompt of the month. DON’T be cliché! Write something new, something we haven’t seen before. Writing a well-known plot with well-known characters is a definite way to lose a reader’s attention. If they’ve read it before, they probably aren’t going to stick around to hear you rehash the story in different words. DON’T try to tell a saga in a 500-word word limit. If you try to spin a complicated web of alien beings that live on another planet, speak another language, and have their own wacky laws, chances are you probably won’t be able to fit a meaningful plot in the story. The story will most likely be all description, or, if not, it will probably leave the reader confused. With a restricting word limit, it’s better to put a fresh spin on something familiar. That way, you don’t have to waste words describing every single thing in the situation. You can just play off the reader’s knowledge, something you can’t do when the story is set on the planet Titan. DON’T go over the word limit or past the deadline! This is such a biggie. Even if your story or poem is beautifully written with a riveting plot, my hands are tied if the entry doesn’t meet the guidelines. Unfortunately, this has happened a few times already. It’s just not fair for us to pick your story over all the other entries that followed the rules. It’s not just us; you will face deadlines and guidelines like ours in the writing industry all the time. It’s vital that you learn how to follow them. On the same note, make sure you follow the theme. We simply will not publish anything that does not fall under the prompt. Creativity is great, but a blatant disregard for our theme is not. Whew! Don’t be discouraged, though, because I also have some tips on things that you should do. Basically, things that tickle me pink when I see them in an entry. DO be creative! The crazier, the wilder, the more unique an idea is, the better the story will be. As long as you can express it sanely and clearly within the word limit, go nuts! I love seeing pieces that light up my imagination in a different way. Being fresh and bringing in our own ideas and perspectives is a great way to stand out as a writer. 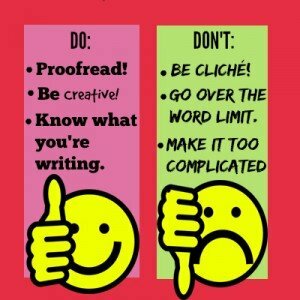 DO proofread! I’ll be frank. Nothing breaks a reader out of a story’s spell like bad spelling or grammar. A small mistake isn’t a big deal, but a big enough one will pull the reader out of the story so all they can concentrate on now is the irritating mistake. DO know if what you’re writing is a story or a poem. Confused? Let me clear it up. A short story must have a beginning, a middle, and an end. That is vital. There must be a clear protagonist(s), with a clear conflict, which they then resolve. It can be a small conflict, or it can be a great conflict, but the reader needs something to be worried about, and, ultimately, something to be satisfied over when they read your story. A description of a moment does not make for a good story. For example, describing a beautiful sunset is not a story. Describing a beautiful sunset while the protagonist makes a realization about an issue that had been bugging them? That’s a story. The moment itself would make for a great poem, though. Know whether your idea is a story or a poem. So that’s basically a summary of everything I’ve ever wanted to tell a writer since I took up this job—which I’m loving, by the way! Overall, though, the quality of entries astounds me every month. I really do hope you find my submission tips helpful and find it worthwhile to keep participating! As the past months have been such a success, Laura and I have just come up with new prompts to keep this monthly feature going! I’m very excited for what the next few months bring to my inbox. Do you have any suggestion or tips for us? Anything you’d like to see in jaBlog! in the future? Please let us know in the comments section of this post, and we will see if we can incorporate it into the blog! Great tips, they really will help!